When you’re competing against hundreds for the same job - how do you stand out? A plain old CV just doesn’t cut it anymore. In order to get noticed, job searchers have come up with some pretty weird and wonderful ways to grab the undivided attention of recruiters. Some are ingenious methods that both grab attention and demonstrate key skills needed for the job. Others waste time and money for all involved. Read about 7 crazy creative job hunt strategies and decide for yourself! Graeme Anthony decided to go the extra mile. Instead of simply writing down his resume, he posted an interactive trail to Youtube to impress his possible future employers. He allows the watcher to navigate to whatever section interests them: About Me, Portfolio, Skills, Timeline or Contact. With the help of jump cuts, funny props and humour, Graeme secured a job AND his video has since amassed over 560k views! Victor Petit realised that getting an interview at a communications agency could be difficult, so he decided to let his CV do the talking… Literally. 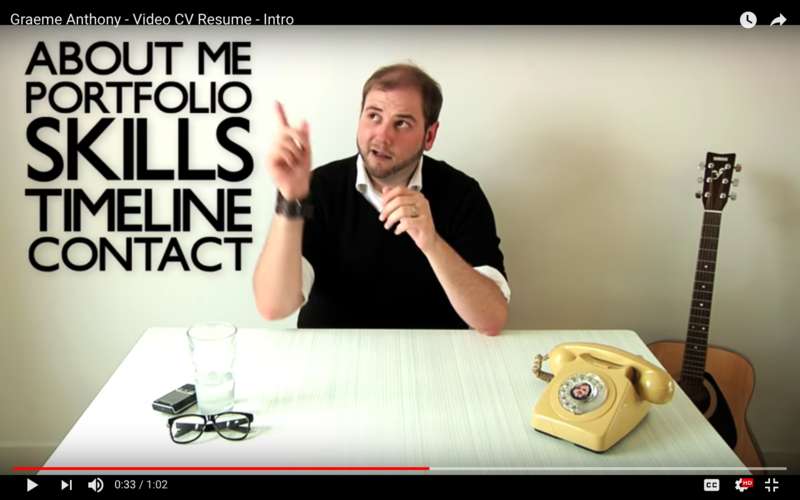 As seen in a brilliant video (which has 675k views at the time of writing), all it took was a QR code and some brief instructions to allow his resume to come alive and ‘talk’ to the recruiter. His clever combination of physical paper and digital innovation created a massive buzz, news coverage and most importantly, attracted multiple job offers thanks to his creative job hunt tactics. Eric Gandhi presented his CV as Google search results and successfully got offered a job by the company itself! This story is perhaps only one-upped by Alec Brownstein, who took the fact that everyone Googles themselves, to the next level. Alex bought sponsored links through Google Adwords so that whenever top advertising directors Googled themselves, his ads would pop up imploring them to hire him - genius! One of the most frustrating hurdles of creative job hunting is just getting yourself seen. Julie Sarpy tackled the issue by renting a billboard in Dallas that read ‘Savvy Chic Stylopolitan Fashion Guru For Employ’ along with her details, but to no avail. In a slightly more successful attempt, a graduate spent his last £500 on a billboard. His campaign ‘employadam.com’ meant he landed a job at a top media firm. This technique also worked for a graduate who stood in a busy London train station holding an advert for himself. It is possible to apply for a job in a cool and creative way, without attempting some of the crazy and creative job hunt methods on this list! If you set up a profile with Tempo, you can record a video and let your personality shine. There’s no need to resort to outlandish or crazy stunts when everything you need to impress an employer is right there ready to use. Let your creativity shine, and record your video profile with Tempo now.